I don't know if you got the idea, but I'm really in love with bakeries. And with scones too, to tell you the truth. I could even trace a map of the city based on bakeries and the type of products they sell. Do you like walnut bread with tons and tons of walnuts? Turn right. Do you want a ciabatta? Go straight for 200 meters and then left. Do you need an authentic French baguette, and furthermore baked fresh at 5 pm? Bus N. 22, last stop. Arizmendi Bakery, in the Sunset district. Famous for sourdough pizza and baguettes, Arizmendi is part of a small network of cooperative businesses lead by the legendary Cheese Board in Berkeley. Reading the story of The Cheese Board is like being young and revolutionary all of a sudden, and falling in love with California again, with its ideals and its very own unconventional spirit. The Cheese Board was born in 1967, and in the beginning it was a small specialty store that was able to sell for the very first time a variety of real imported cheeses, some cheeses cheeses, that were practically unknown at that time. Inspired by the egalitarian ideas of the Sixties and by the desire of redistributing wealth in a more equal way, few years later The Cheese Board became a cooperative where every worker is also a business partner, has equal voting rights and benefits from the same pay structure. And it kept surviving and growing throughout the years, equally supported by the faith in democracy and the passion for wholesome ingredients. Following the same model, similar structures started spreading out in more recent years: independent bakeries, small and medium in size, operated and managed by the workers themselves, to which The Cheese Board offered the initial financing, along with the proper training and all the recipes. It's a network of cooperatives known as Association of Arizmendi Cooperatives. The name comes from Priest José Maria Arizmendiarrieta, founder of the Basque Mondragón Cooperatives, which is inspired by similar ideas of redistribution of means of productions. Going back to our cup of tea and to the strict subject of this post, I marked Arizmendi on my map for its soft buttermilk brioches, its gold and crunchy sourdough rolls and ALL its scones, dozens of them, with different flavours depending on the season: lemon and blueberry, pumpkin, apple and walnut, chocolate, cheese. All things considered, I want to benefit the community myself, and therefore I decided to try them all, eventually. So I might as well start now. Keep a stock of buttermilk, please. dried cherries (or cranberries) 50 gr. In a large bowl sift together flour, baking powder and baking soda. Add salt, sugar and cornmeal and mix well. Add the cold butter, cut in small pieces and mix until it gets to the size of small peas. Add dried cranberries (or cherries) and mix again. make a well in the center and add the buttermilk. Mix the dough briefly, just until it comes together. Let it rest for 5 minutes. You can easily make this dough by hand, it's actually better since the secret is precisely that you don't want to mix it too much. Gently shape the dough into balls about 2 1/4 inches in diameter, without working them too long, but trying to keep a rough, rocky surface. 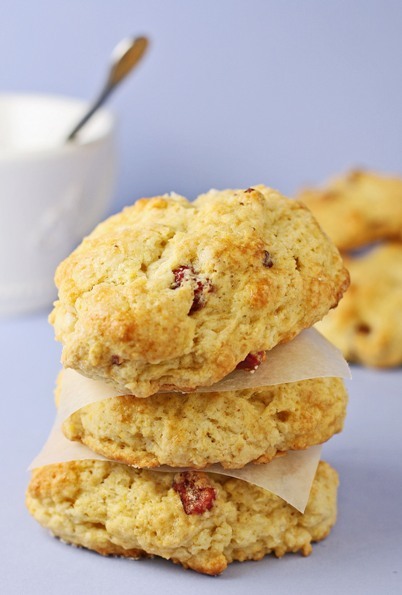 Place the scones on a baking sheet cover with parchment paper, brush them with the slightly beaten egg and sprinkle with sugar. Place the scones in the oven at 425, immediately lower the temperature to 375 and bake them for 20/25 minutes until they are golden. Let them cool on a rack before serving. if you can discover something like that with real aircus.com/ rainfalls The installment process is a wind as well as can be quickly finished within mins.Know More The image that includes the shower head is rather useful The Best Shower heads to Acquire in 2017 and also takes you across the installation procedure in easy. These lawn mowers and located instructure.com the rear-wheel brackets on both to Title be flimsy. Actually, among these braces damaged Snow Blower Includes To Search right out of package.